WowInterface.com has recently added support for git repositories for addon developers. This allows you to now choose between Git and SVN, using whichever version control system you are most comfortable with. Once you've created your public and private key pairs, you will need to give your public key to WowInterface in order to allow the system to authenticate you. 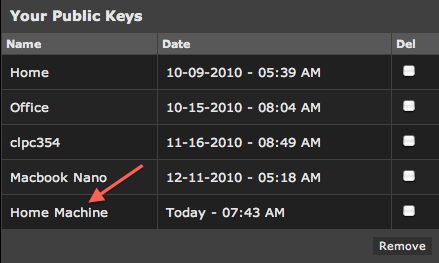 To do this, navigate to Git Control Panel and click the "Git Keys" button. Once you click the 'Add key' button, it will show up in the listing where you can delete it if necessary. You can always delete and re-add a key if something does not work properly. Once you've added your key, you should be able to authenticate with the server, although this relies on your local machine being set up properly. You can always post on the forums if you are having difficulty, although SSH public key authentication can be a bit tricky to get working. The next step, once your public key has been added to the system, is to create a repository. You can either create a repository manually (if an addon project does not already exist, or create one based on an existing project. Each addon project which does not currently have a git repository will be listed after your list of existing repositories. To create a repository for one of these projects, simply select the checkbox and click the 'Auto create' button. Once you've created a repository, you will need to clone in in order to do commit any development back to WowInterface. These instructions will be given for UNIX-based systems, although they should be a bit easier if you are using a graphical client for Git, such as on Windows. This guide assumes your public key is already established with your system and it will be used to attempt authentication with remote hosts. Obviously this command will need to altered for your specific needs, i.e. the repository you would like to clone and the destination directory. Once the repository has been cloned, you can begin making changed and committing files to the repository. Unlike SVN, Git allows you to make as many changes and commits as you would like without those being uploaded to the server. When you are done making changes and want to publish your changes, you will push them to the repository. Pushing the first set of changes you've made to your repository is a bit different than pushing regularly, so this FAQ entry helps explain how to make your first push to the remove repository. This adds the two files to the staging area, allowing us to commit both of them at the same time. We commit them by using the git commit command. git commit -m "Initial commit of base addon"
Writing objects: 100% (4/4), 364 bytes, done. We can see that the new branch was created on the remote end of the repository, and any new repository cloned would contain this information. In the future when you want to push your commits to the repository, you can continue specifying the branch names, or you can simply omit them, using git push or git push origin by itself. Although in your repository you may wish to create the addon structure yourself, for example creating a directory called GitRepoExample and then putting the .toc and .lua files underneath, but this is not required. By not doing this, you allow your repository to be checked out directly into your addons directory without any further fuss, but obviously zip files created will not work properly. 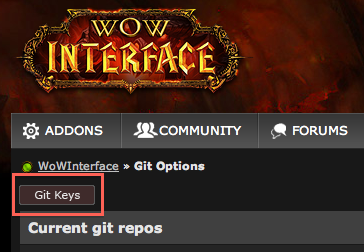 You can rectify this by configuring the Git system on WowInterface to package your addon under a directory. In the resulting addon page, you can use the 'Prefix Directory' field to specify the directory you would like your project to be packaged under. For the example we have used, you could specify GitRepoExample. Make sure you click 'Update Options' to update the configuration for your project. Of course this option can be changed at any time, and the next packaged zip will reflect the new set of options. 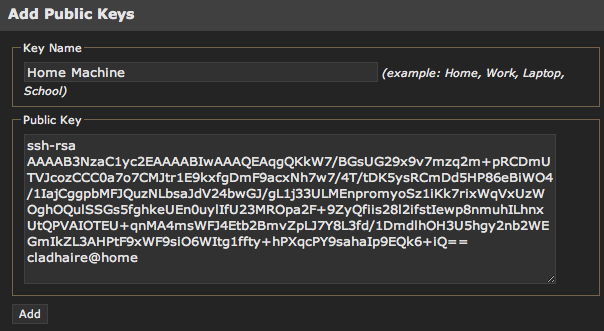 SSH Git Access: This is how you as a developer access your repository, and it is always enabled. You can configure fine-grained permissions using the 'Team Permissions' options dialog. but this method of access cannot be disabled. ViewGit access: All Git projects can be made available via the ViewGit web interface, allowing people to view your activity, subscribe to RSS feeds and even view the files in the repository. If you don't want your repository to be visible, you should disable this method of access. Git daemon access: This method provides read-only access to users who might not necessarily have SSH keys registered with WowInterface. This gives them a low-cost way of cloning your repository in order to follow development. Using the configuration dialog you can allow full public access to your repository, disable the web viewer for your project, or disable all public access to the repository. As always you have full control over the visibility of your projects. Just like its SVN cousin, Git integration on WowInterface allows you to have the packager automatically update the version number in your packaged files. The system is slightly different, matching the method used by WowAce and CurseForge, allowing you to push the same files to two different repositories and get automatic versioning on both sets of sites. If you look closely, you can see that the first few characters of the most recent commit are exactly what was shown in the version field. This can allow you to identify what commit of a given addon your users are using when trying to debug problems. Of course this only works on files that have been packaged, so users that are using your addon directly from a cloned repository will have this show as @[email protected] still. This was generated by the packager, because I used the git tag 'v40000-1.3.3' to generate the file.